Pluto and Charon are in the middle, orbiting around their common center of mass. The four smaller moons orbit around them. When you begin a new research project, you usually have expectations about where it will lead. Most projects take you or less to the expected destination. Some go nowhere. However, every now and then a project picks you up and makes you feel like you’re just coming along for the ride. Today, in the journal Nature, we have published the results of a research project that fits solidly into the third category. Our original plan was straightforward. We had recently discovered two small moons of Pluto, now known as Kerberos and Styx. We wanted to publish a short discovery paper that would just cover the basics: How did we find the moons? What are their orbits? How big are they? What are the implications of the discovery? The Pluto system had other ideas. 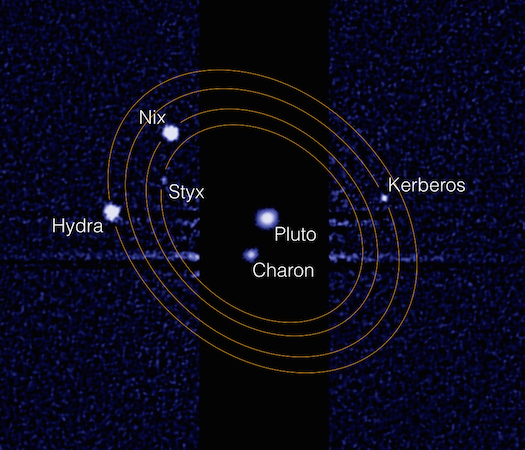 Pluto also has two much brighter moons nearby, Nix and Hydra. They had been discovered years earlier and much had been written about them. I had no reason to think there was anything new to be said about either of them. For me, they could just be my “reality checks” to confirm that I was obtaining valid results. However, my early efforts to determine the size–or at least the brightness–of each moon took a very strange turn. Most moons in the Solar System are in “synchronous rotation”, meaning that they rotate once about their own axis every time they circle the planet. This is why we only ever see one face of our own Moon. The “de-spinning” of a moon happens very quickly, because the gravity of the central planet creates tides, which dissipate energy inside the moon as it rotates. The dissipation can only end when the moon reaches synchronous lock. If Nix and Hydra were in synchronous lock, we would have seen a distinct relationship between how bright they appear and where they fall along their orbits. We didn’t. There was no pattern at all. Neither moon is in synchronous rotation! The same is probably true of Styx and Kerberos, but it has been harder for us to get good measurements of these dim points of light. It finally dawned on me to start thinking about the double-planet in the middle of the system. The moons orbit not one object but two. Pluto has a very large, close moon called Charon, and the two orbit around each other like two unequal weights at the ends of a dumbbell. I could imagine that this might prevent the moons from ever reaching synchronous lock. Imagining it and proving it are two different things. Most orbit simulators track the position but not the orientation of the bodies in the system. I had to re-learn the physics of rigid body rotation and build my own simulator. The movie published today shows the results of that study. Caution: May cause vertigo. After that, I knew this was not going to be just a short discovery paper. I also knew that I had better check every other detail of the system just in case the Pluto system held more surprises. I was not disappointed. For example, we have determined that Kerberos is an oddball–an extremely dark object in the midst of much brighter moons–a charcoal briquette surrounded by dirty snowballs. Hypothesis #1: A snowman broke apart and Kerberos was one of the eyes. Hypothesis #2: Kerberos is a monolith. Seriously, we don’t know what to make of this result. If the moons all formed at the same time, then we would have expected them to look alike. They don’t. In the end, the paper is sort of a grab-bag of strange results about the Pluto system. The best I can do to summarize it is to make an analogy. Imagine that you are an archeologist and have just recovered a few fragments of an ancient scroll. The pieces themselves are hard to interpret, but you know they have to fit together in some way that tells a bigger story. In this case, the story is how the Pluto system formed. The full story remains to be told, but now we know that it will have at least a few very interesting paragraphs.